Space-fill drawing of the outside of one Zika virus particle, and a cross-section through another as it interacts with a cell. 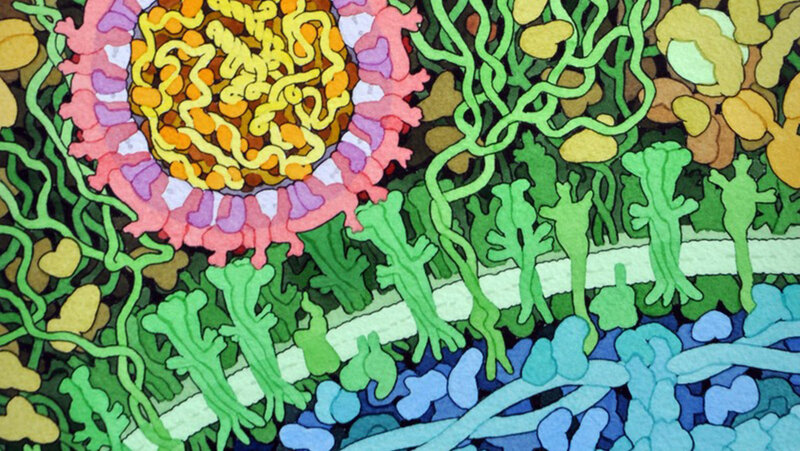 Image courtesy David Goodsell. Are you passionate about science education? If so, we have a unique hands-on opportunity for you to be a part of real teams of scientists and educators. This opportunity doesn't require any previous lab experience, and is open to undergraduate and graduate students in the United States. The internship will be split between the J. Craig Venter Institute (JCVI) and the Smithsonian Science Education Center (SSEC). At JCVI you will participate in cutting-edge research. This will dovetail into curriculum enhancement previously developed at the SSEC, which aligns with the U.N.’s Global Sustainability Development Goals (SDGs). This is an excellent opportunity for both science majors who may be interested in pursuing a path in education, and for education majors looking to gain valuable experience in a professional laboratory. At the JCVI, you will work on a part of a larger project geared towards the development of rapid tests for virus genes that suppress host antiviral defenses. The project, which will focus on the mosquito-borne Zika Virus Disease, will use synthetic biology techniques to help scientists identify virulent strains. At the SSEC, you will work with curriculum developers and experts in the field of global science education to support the development and rollout of the SSEC’s curriculum module “Zika!,” which helps students understand mosquito-borne diseases through inquiry-based science education methods. The outcomes of this internship will lead to not only a better understanding of current research being done in the field, but will also result in the development of effective ways to communicate scientific research to the public.